Welcome and thanks for landing on shared hosting definition and tutorials. Today we will discuss everything about the shared hosting. Go through the tutorials, and try to find your solution, in case you wish to ask different than the covered topics, feel free to contact us. We will cover 6 important aspects of the shared hosting plans offered by the different web hosts. 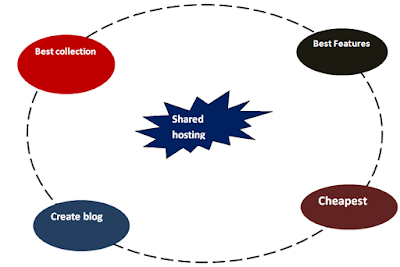 Features of the shared hosting. First you should know what exactly is shared means in terms of the hosting? Because it is very important to know for the beginners. If you want to understand it in a more simple term, then you must be knowing paying guest or hostel where people will share things with other people. Now we will see the pros and cons of the shared plans by the web hosts. It is very important to know for you, if you are a new webmaster because affiliates will not tell you. Cheaper – Yes, if you will go for the shared plans, then it will hardly cost you few dollars/month. Many web hosts will give you shared hosting at $2/month to $3.93/month. Easy maintenance – You need not worry about the maintenance of the server part because it will be taken care by the web hosting providers itself. Multiple websites hosting – Many best web hosting providers will allow you to host multiple domains on a single account. Security issues – If any website on a server will be affected, then the whole website of a network will see some dark side of it. Resource limitation – You will experience some resource limitation once your website will grow or hit large traffic, because you will be sharing the resources with other websites, like CPU, memory, and hard drive. Fewer Features – Many web hosts will give you fewer features as compared to the VPS hosting or the dedicated server hosting. Customer support – You will not get live and instant customer support like dedicated servers. This is the very important section of the shared hosting definition and guide. Because we have shortlisted few web hosts that will offer rich features at low cost. If you wish can use our discount coupons to get more benefits. Hostgator will be seen everywhere in google, and hence, we can trust Hostgator services. Anyways I am using Hostgator on one of my websites, and I am happy with it. Their shared hosting plans will range from $5.56/month to $11.96/month. You can use our discount coupon (SharpLesson1cent) to get any shared hosting plan at just 1 cent. If you will like then continue, otherwise get your full refund within 45 days. Click the link, and enter above mentioned coupon code while making the payment and you will get the discount. Get 30% off, ad get the plan @ $4.86/month, instead of $5.56/month. Need not to enter coupon, you will see automatic update in the price. Discounts are for limited periods only. My second choice will be the bluehost as a shared hosting provider. In fact, you can Install WordPress on bluehost, because it is being recommended by the WordPress itself. Their price range will be $7.99/month to $23.99/month. Just click the link, and you will be redirected to bluehost website, and you will see the difference of price. It means you will automatically get the discount and will be eligible for $3.95/month. Again, discount is for limited period. You can get almost 50% discount now, if it is clickable then the discount is applicable. We trust dreamhost because they offer 97 days to get your money back. It means, even if after 3 months you can get your money back. Their price range from $8.95/month to $19.95/month. To avail $50 discount on your purchase, you have to use (SHARPLESSON50) coupon code while making the payment. If you want lifetime benefits, then you have to use (SHARPLESSON45) coupon code. Simply click on the link, and use any of the coupons available. Bigrock is again one of the trusted brand in the online world. The best part is its cheaper rates with good service track record. The price will range from $4.29/month to $6.09/month. 25% off and 10% off will be applicable till 31 december. Just click and purchase your plan, discount will be automatically added. Don’t wait long to get 35% discount in total. Yes, get your window hostig @ $1.59/month. Instead of paying $6.09/month, pay just $1.59/month. Discount is for the short period only. Glowhost is a good web hosting service provider for a new webmasters. The price will range from $4.48/month to $9.98/month. Pay for one month, and get two months free web hosting. You need to enter coupon code (2FREEMONTHS). Pay for 6 month, and get two months free web hosting plus Free PPMotion installation. You have to enter coupon code (PHPMOTION). Discounts are available for limited period, if it is clickable that means it is active one. One hosting will give you 1 year free web hosting, and no web hosting providers are doing such things. It means if you will pay for one year than you will get additional one year at free. In case, you will not like one web hosting, then ask for the refund. Their plan will range from $5/month to $12/month. If you want 1 year free web hosting, then click on first link. If you want 1 year free domain name, then click second link. Discount will be added automatically. The myhosting is a award winning web hosting service providers. The web hosting plans by them will range from $4.95/month to $18.95/month. Avail straight $10 off by using MYHPREMIUM10 coupon code while making the payment. Get free domain registration, if you don’t want to use $10 discount coupon. These discount is for limited period, if it is clickable then you can avail it. Note: Domain registration price will be around $12/year, and you will get it free. If you are looking for web hosting plans or WordPress plan at siteground, then you will get it at $9.95/month. Instead of paying $9.95/month, just pay $3.95/month. Get 60% discount on any purchase. Discount will be applicable only till December. Inmotion hosting is again among the top shared hosting service providers with solid support. The price will range from $7.99/month to $15.99/month. Discount:Yes ( shared hosting @ $4.89/month). It means, you will get almost 40% discount. Only for limited time (Decemeber only). No need to enter coupon code, just click and discount will be automatically updated. We have removed one of the web hostings from our top 10 shared hosting definition and guide. Why? Because we did not get the positive feedback for it by our readers and hence we have removed it from our list. Anyways we have the best collection of the shared hosting providers. In case, you find any of the web host is not upto the mark, let us know and we will remove it from our list.